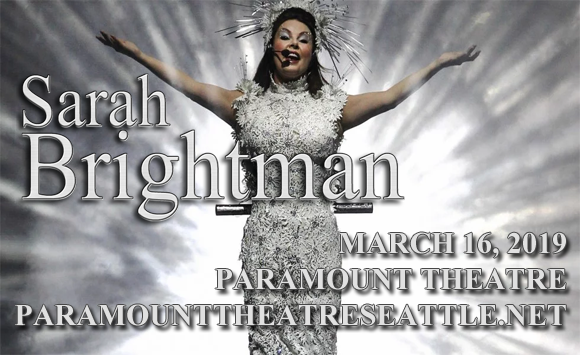 Coming to Paramount Theatre Seattle on Saturday 16th March 2019 is internationally renowned soprano singing sensation Sarah Brightman! The uniquely talented artist will be performing songs from her recent fifteenth studio album, Hymn, which has a spiritual, uplifting feel that will be reflected in this stunning stage show! The Hymn tour couples Brightman's heavenly voice with grand choral backing and gorgeous sets, for a transcendent experience that you'll never forget! Best-known for her theatre work on Broadway and the West End, as well as her solo career as a classical crossover artist, Sarah Brightman is an English soprano singer, actress, musician, songwriter, conductor, and dancer. Brightman began her career as part of Hot Gossip – a dance troupe with whom she had the 1978 disco hit "I Lost My Heart to a Starship Trooper", which reached number six on the UK Singles Chart. In 1981, she made her West End debut in Cats, which began her reign as a musical theatre star throughout the 1980s. She was the star of several West End and Broadway musicals, including The Phantom of the Opera, where she originated the role of Christine Daaé. Brightman retired from the stage in 1990, and looked to reignite her music career, which she did alongside former Enigma producer Frank Peterson, originating the classical crossover genre. In 1996, Brightman released a duet with Italian tenor Andrea Bocelli, "Time to Say Goodbye", which is one of the best-selling singles of all time. Brightman has sold more than 30 million records and 2 million DVDs to date, and has achieved over 180 gold and platinum record awards in 38 different countries. Her fifteenth full-length album, HYMN, will be released in 2018.